While speaking with Automotive News Europe, Lamborghini Chief Executive Officer Stephan Winkelmann stated that the 50th anniversary celebration would include the debut of a new one-off supercar with the only hint offered about this unique vehicle is that it will not be a revival or a retro vehicle. The 50th anniversary car will debut in cooperation with the Grande Giro Lamborghini – a cross country tour across Europe that ends up at the Lamborghini headquarters in Sant'Agata Bolognese featuring privately owned Lambos from around the world. Unfortunately, nothing is known about the one-off supercar that will help Lamborghini celebrate their golden anniversary but there is one safe assumption – this could very well be the most incredible and the most extreme example of Italian performance that the motoring world has ever seen. If this mystery car is not a revival and it is not a “Retro” model, we can only guess that it will be a rolling display of everything Lamborghini is capable of if they were to put it all into one vehicle. Considering that this car will be a one-off, the company will not have to worry about nonsense like fuel economy, engine emissions or (most importantly), the cost. Should the company put this historic car up for sale, it would most certainly become a bidding war item that could end with the world seeing one of the highest selling prices in the history of the auto industry. That being said…I would guess that this celebration car will stay in the hands of Lamborghini. If nothing else, the car that will debut next May should be the highest performance car ever built by Lamborghini. 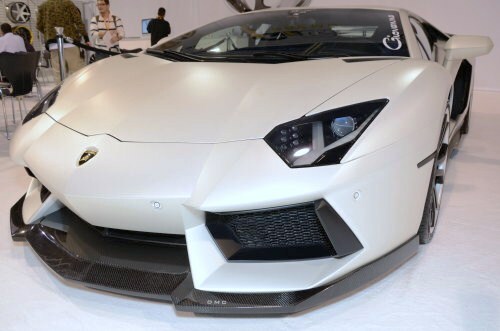 To be the highest performance Lambo ever, this mystery car will have to best the recent Lamborghini Sesto Elemento. With “only” 570 horsepower, the Sesto Elemento didn’t shock the world with an incredible power output but rather, the ultra lightweight carbon fiber design affords the Sesto a shockingly low curb weight of just 2,200 pounds. I would expect that this 50th anniversary car will also make use of huge amounts of carbon fiber as to keep the weight extremely low but where the Sesto Elemento pulled its power from the V10 engine borrowed from the Gallardo – the mystery car could be powered by the V12 found in the current Lamborghini Aventador. The Aventador offers 700 horsepower so even if the company uses it in stock form, combining that drivetrain with a lightweight design similar to that used on the Sesto Elemento would likely make this one-off supercar the best performing Lambo ever…while possibly setting the standard by which all other supercars are compared. The other reason that the debut of the Lamborghini 50th anniversary supercar is so exciting is in the different aspects of this one-off sports car and how they could be applied to future production models. When a company shows off a car like this mystery car or the Sesto Elemento, they feature engineering and design elements that are likely to work their way into the next generation models. The carbon fiber design of the Sesto Elemento was what made it so expensive to produce so for the time being, that model only saw 20 produced and those models are not street legal anywhere in the world. However, as the cost of carbon fiber or other high tech, lightweight building materials comes down over time, we are more likely to see design elements from these ultra exclusive supercars showing up on the normal production models like the Aventador or the upcoming replacement to the long-running Gallardo. As a lover of the Lamborghini brand, I expect that the 50th anniversary car will be amazing and I cannot wait to see what the company has in store for that one-off – and the other new models coming in the near future. In the meantime, things are going great for the Lamborghini brand with the Aventador (shown above on the right) selling so well that there is currently an 18 month waiting list to buy one.